In our area of Connecticut we can find many Chinese chestnut (Castanea mollissima) trees on old farmsteads and in a few parks. They don't make good landscaping trees because of the spiny hulls that drop to the ground, and I have found sources of nuts by asking on Freecycle and offering to help clean up a person's yard in exchange for the nuts. 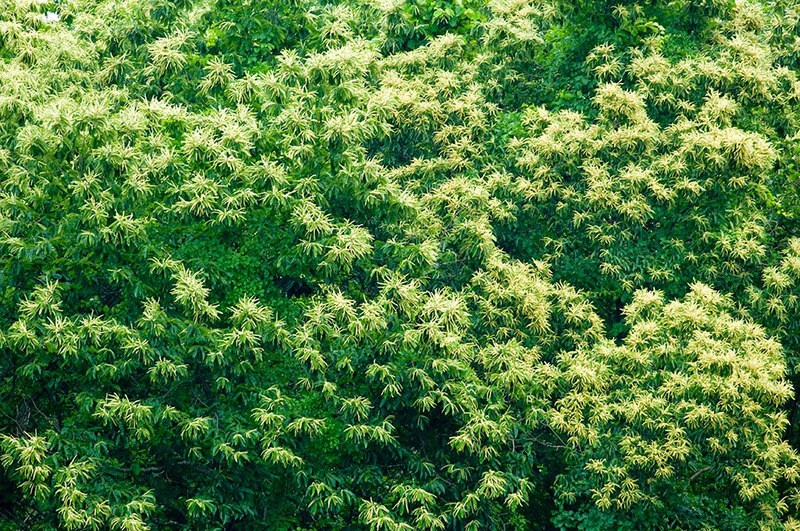 The native North American chestnuts had been mostly wiped out by a fungal blight, although there are groups working to hybridize them and make them resistant to the blight. 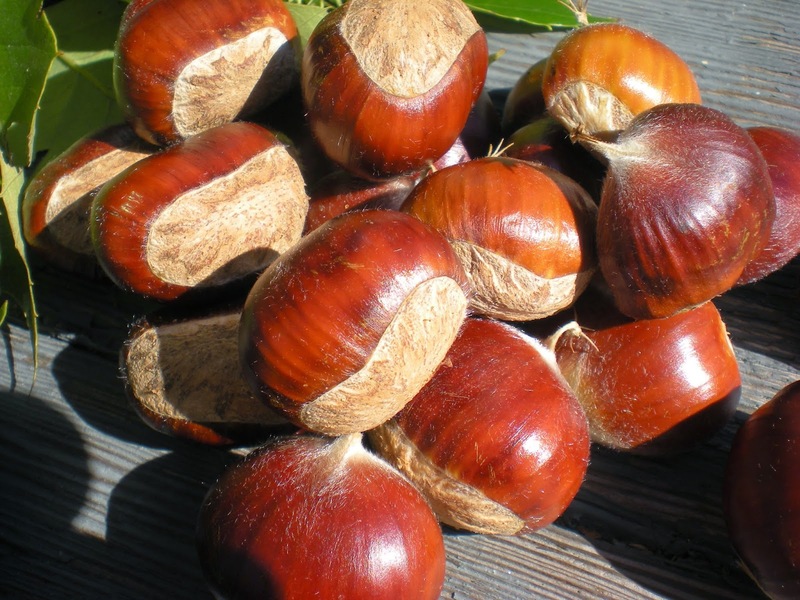 An estimated 3 billion chestnuts trees died from the blight introduced in the early 1900's. 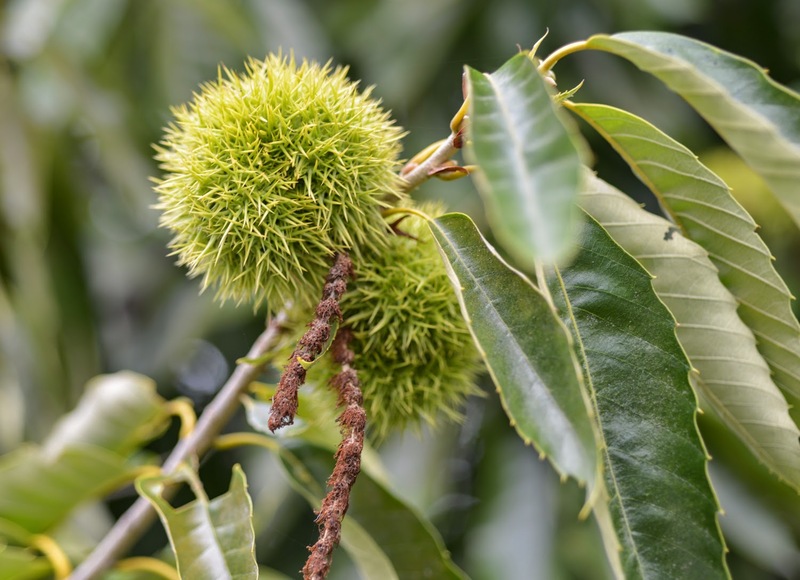 We find the Chinese chestnuts have good flavor, even better than the imported Italian chestnuts we can buy at the grocery store, but supposedly not as good as our native chestnuts. This year was mostly a bust for most nuts, including black walnuts, white oak acorns, and hickory nuts, but we did mange to find a good amount of chestnuts to eat. Gillian likes them boiled and peeled, and we sometimes have a hard time getting her to stop eating them all before we can cook with them! 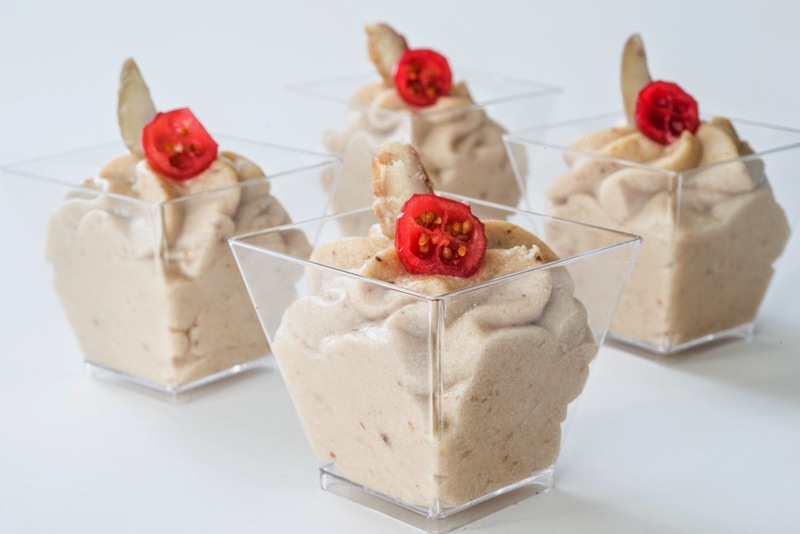 I add them to rice pilaf and made a squash-chestnut soup with wild maitake mushrooms, but this dessert mousse is our favorite. Most of our boiled and peeled chestnuts are portioned out in the freezer, ready to thaw and make mousse later in the year. 1. Place the chestnuts in a small saucepan with the milk and 3 Tbsp. spiced rum. Simmer for 20 minutes, until the chestnuts soften and the milk reduces. Puree the chestnuts and milk in a food processor until smooth, and cool. It will be quite thick. 2. In a mixer bowl, combine the whole egg and the egg yolk, whip on high until thick and frothy, about 6 minutes. 3. In another small saucepan, combine the sugar and water and bring up to a boil. Cook until it reaches 235 degrees, or soft ball stage. Pour the hot sugar into the egg and whip on high until cooled, about 8 minutes. It will be thick and light yellow. 4. Whip the heavy cream to stiff peaks. 5. In a large bowl, whisk the final 1 Tbsp. of spiced rum into the chestnut puree. Pour half of the egg/sugar mixture into the chestnut puree and whisk it together until smooth. Add the remaining egg/sugar mix and whisk until completely smooth. Gently fold in the whipped heavy cream, mixing until no white streaks remain. Pipe into serving glasses, or into a cake lined mold and chill. The mousse will thicken and become firm as it chills. Serve with cranberry sauce or shaved chocolate.